Ergonomics is the applied science of equipment design. Office ergonomics is intended to setup a work space that fits you and the work you are doing. This will maximize productivity by reducing fatigue and discomfort. Although too much sitting can still have a negative impact on your health you can minimize the risks above with an ergonomic work space design. 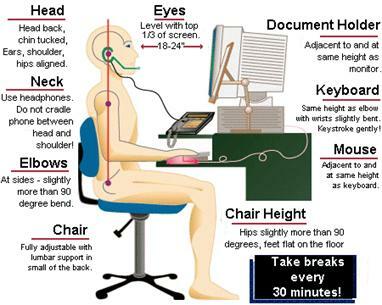 Here is a diagram (source) to help you set up your workspace with an ergonomic design. Be mindful of your posture. Sit up straight, keeping your torso perpendicular to the floor. When possible, use a headset for phone calls to prevent neck strain. Thighs and feet should be parallel to the floor. If your chair needs to be at a height where your feet do not touch the floor, use a footstool. Keyboard and mouse should be the same height as the elbows (which should be bent slightly more than 90 degrees). Eyes should be level with the top 1/3 of the screen and the screen should be about 18-24 inches away from the screen. The Mayo Clinic also has a great how-to article for you to reference, here. Can your work space use some adjustments?